Atlanta-area’s Kim Gordon wowed us all with her artistry in 2017’s Color Outside the Lines Contest. 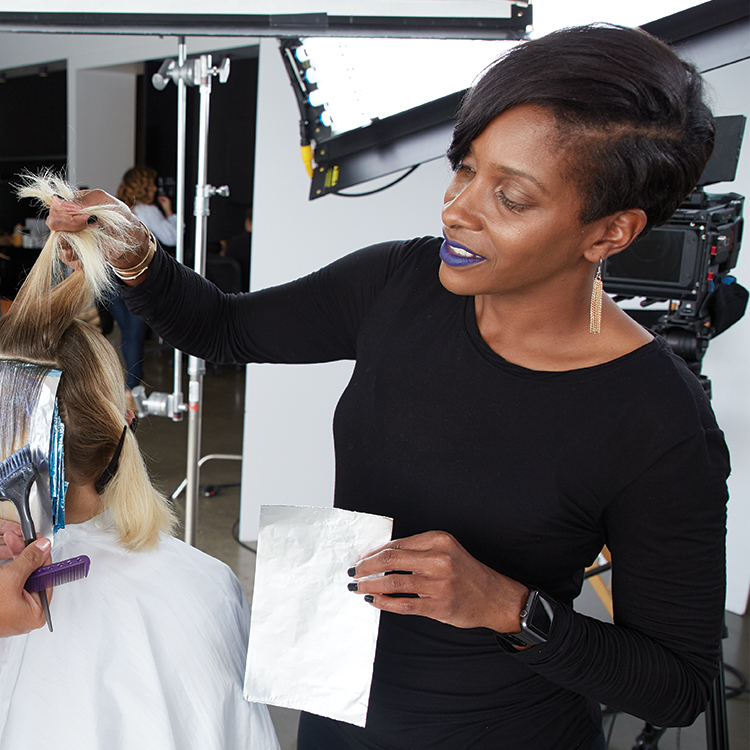 As our Best National Grand Prize Winner, Kim enjoyed a collection of products, a trip to Gathering in Italy and a visit to Los Angeles to participate in a Paul Mitchell® collection shoot. We caught up with Kim afterwards to find out about her experience, her advice for those joining the Color Outside the Lines Contest and what’s next for her bright future. How did you get into the styling business? I started by watching tutorials of other stylists doing hair! Beginning in high school, I would practice on my family, as this made me feel comfortable when it came to dealing with hair. I’m the only stylist in my family, and have lots of female relatives, which drove me to want to make an impact and be motivating and inspiring to the world. What brought you to choosing Paul Mitchell®? I was introduced to Paul Mitchell by two of my former graduates (Kathy and Ariel Goodson) from the Paul Mitchell School Esani in Georgia. They encouraged me to come to the school, as they thought that I would be a perfect fit. I had only been an educator for one year, and was doubting myself. I was uncertain if I was ready to be part of a huge company. But after interviewing and touring the school, I felt right at home. Now, I have been with the Brand for 10 years as a Learning Leader and four years as a National Educator. Every day, I feel more and more inspired and welcomed. What was the highlight of your trip to L.A. as winner of Color Outside the Lines last year? The greeting that I got from Brand Manager Andrea Espinoza-Coto and Marketing Coordinator Kelsey Hyatt—they set the tone for the trip! There is nothing like feeling comfortable and loved from these two ladies, as I came to a place that I had never been before. Thank you ladies, AGAIN! It was super to be on the set of the photo shoot with Lucie Doughty and Colin Caruso and feeling re-inspired. I got to meet the staff at the Corporate Office for John Paul Mitchell Systems® and to see the people behind it all was great. I loved every minute of my trip, and I can’t tell you how grateful I am for it all. Any advice for those planning to participate in this year’s contest? Start early! Gather your thoughts and everything that you may need to have in a good timeframe. Have a game plan on what your theme and colors will be. Create a vision board of everything that you gathered for the contest including colors, wardrobe and makeup. For myself, I turned my theme into a photoshoot. I planned the day and had a powwow with my team of makeup artist, model and photographer. This helped everyone know what is expected and how the day will flow. I plan to dedicate more time volunteering in the community. I also want to train and educate more internationally! I want to become an American Board Certified Colorist. My goal is to become more involved with my John Paul Mitchell Systems family. Lastly, I want to be happy and do what I love every day! Ready to be our next Color Outside the Lines winner? Click here to enter today!